"It's the car, right? Chicks love the car." - Batman, to Nicole Kidman in Joel Schumacher's Batman Forever. 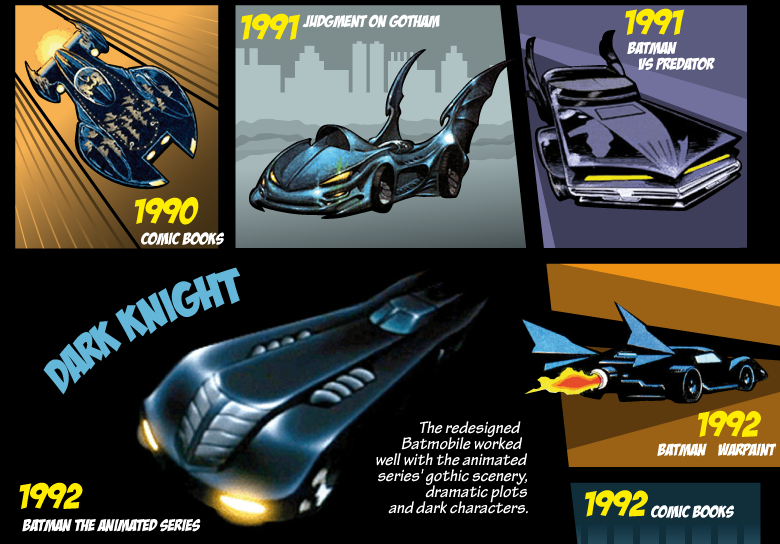 How freaking true, judging by the complete infographic depicting the evolution of the Dark Knight's most famous ride: The Batmobile. Batman is many things, but definitely one of the coolest things being Batman would be his rides. All seventy years' worth of it. Since its first appearance in the pages of Detective Comics #48 in 1941, the Batmobile, unquestionably the most famous vehicle in all comic book superhero fantasy, has seen countless variations. From the comic books, TV series, cartoons, to the movies, the Batmobile's design ranges from the practical (Christopher Nolan's tumbler) to the intrepid (almost all the comic book designs). A must-see for any self-respecting Batman fan, CarInsurance.org has conjured an incredibly enormous infographic charting the entire lineage of the Batmobile.